Crow is all alone. But like all crows, he is very clever. Using autumn leaves for wings, sticks for the body and a crab apple for the head, Crow makes a friend! But winter winds blow in, destroying his creation. Undaunted, Crow fashions another bird friend out of snow but cannot prevent it from melting in the warm spring sun. 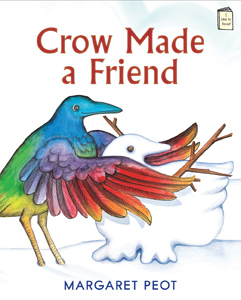 Alone again, Crow hears the caw, caw, caw of a real, live bird and finally forms a friendship that will last in this warm, satisfying story that celebrates perseverance and ingenuity. I'm always on the lookout for good children's books. My daughter is what would be considered an "early reader" (she's in the 1st grade and reads above grade level) and my son is a pre-reader. So, when I came across this book, I thought it might be a good fit for our family. I gave this to my daughter to read and I have to admit that it was far too easy or her. This book is designed for readers aged 4-7, and I think it is really aimed more at the 4 end of the spectrum. However, I did find it to be a good book to read to my son and then talk to him about it as we read it. In that respect, it is probably a better fit for the for the preschool group. The story is simple and simply told, which is perfect for an early reader book. I loved the illustrations--the are simple yet colorful (I know...crows aren't colorful, but they are in this book and that is okay!). Too often in picture books, the illustrations take over the story...or they are so bland that they don't hold the attention of young readers. This book, however, balances narration and illustration quite nicely. While this book isn't a good fit for our family at the moment, I am going to hold onto it until my son begins reading, when I think we will be reading it...over and over again. 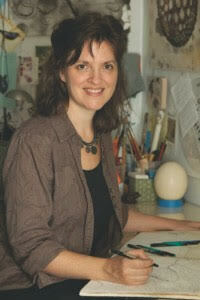 Thanks to TLC Book Tours, I have one copy of Crow Made a Friend to give away to one of my readers (US only). To enter, please use the rafflecopter form below. This giveaway ends at 11:59pm on Sunday, November 8.